The PF400 was released last year, but the PreciseFelx SCARA has been collaborative since it was released four years ago for the Life Science market. It uses servo motors equipped with absolute encoders and moves very quietly. Its controller is embedded inside the robot arm, which results in a very small footprint. The PF400 does not come with a physical teach pendant. The robot can be controlled using a web interface or it can run stand-alone in automatic mode. Teaching robot positions by demonstration is easy. Motors on axes 2, 3 and 4 can be deactivated (they don’t have brakes), while the break on axis 1 can be released by pushing a button beneath the proximal link of the robot. The robot can be programmed by using so-called motion blocks or with the help of a custom programming language. PF400’s payload is only 0.5 kg and its linear speed is limited to 500 mm/s. In manual mode, the linear speed is further limited to 250 mm/s. 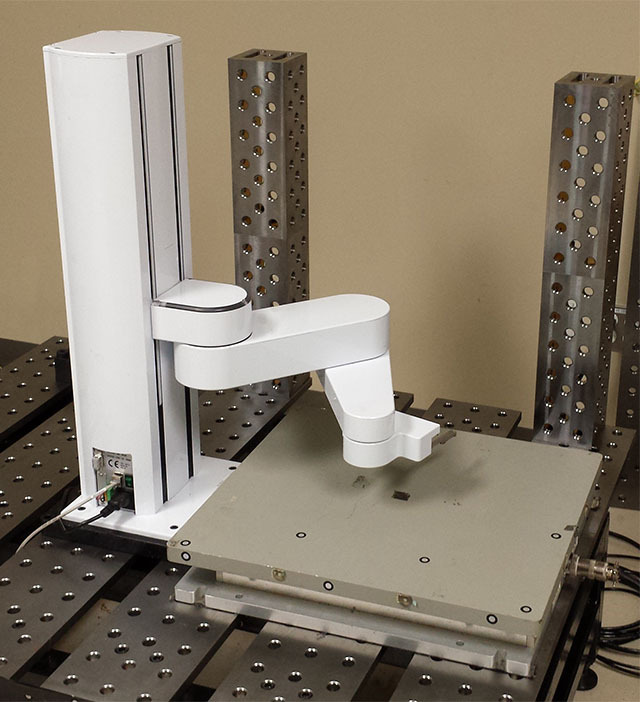 Nevertheless, we performed a series of impact tests using our AMTI six-axis force plate. The maximum impact force registered during vertical motion (axis 1 only) was about 420 N. The maximum force in a horizontal motion was only 360 N. Furthermore, at large impacts, the robot is deactivated almost immediately (after 0.02 s) and the residual forces are very small (about 50 N in the case of vertical impact). Note, however, that our tests do not necessarily represent reality. Although we placed a small rubber mat on the robot at the impact location, this mat does not have exactly the same compliance as the different parts of the human body. A larger compliance will obviously lead to smaller impact forces and vice versa. An interesting safety feature of the PF400 is that it can change from lefty to righty configuration, only by retracting its links, rather than by fully expanding them. This, however, might lead to slightly longer cycle times in some situations (compared to having no mechanical limit at the elbow joint). Furthermore, there is a risk of self-colision that cannot be prevented by the robot controller. This should be done in future versions. Finally, there is a risk of pinching between the distal link and the proximal link, but although we did not evaluate this risk properly, a serious injury seems highly improbable. Indeed, the company showed me a video of Brian Carlisle pinching his fingers intentionally. Another potential safety risk is associated with the fact that the PF400 does not come with an emergency stop. Fortunately, such an E-stop can be easily connected to the robot’s base. In conclusion, the most dangerous part of the robot is its gripper, due to its pointy shape. It is quite obvious that safety goggles must be worn by all personnel in the vicinity of the robot, when the latter is active. Other than that, the robot could hardly be any safer. Tagged collaborative robots, safety, SCARA robots. Bookmark the permalink.